The Spanish Civil War broke out on July 19, 1936. In the broadest terms, the war was a military coup, led by General Francisco Franco and instigated to overthrow the democratically elected government of the Spanish Republic, a coalition of leftists and centrists. From its inception, the civil war aroused the passions of those who saw Franco’s actions in Spain as the front line of a rising tide of fascism across Europe. This view was fortified when Franco received material support from Germany and Italy. Many leftist intellectuals and artists internationally—including Capa, Chim, and Taro—were committed to the antifascist struggle, and they provided vivid images and texts in support of the Republican cause for the international press. The Mexican Suitcase negatives constitute an extraordinary window onto the vast output of these three photographers during this period: portraits, battle sequences, and the harrowing effects of the war on civilians. While some of this work was known through vintage prints and magazine reproductions, the Mexican Suitcase negatives, seen here as enlarged modern contact sheets, show us for the first time the order in which the images were shot and in some cases the full extent of a particular story. Images that have become iconic over the years can now be seen and studied in their original context and sequence. 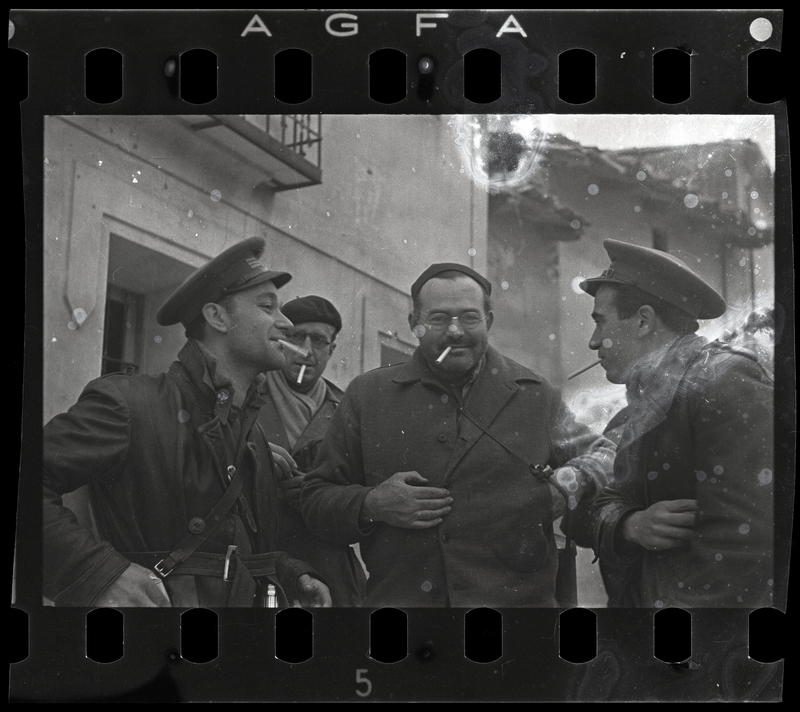 This material not only provides a uniquely rich view of the Spanish Civil War, a conflict that changed the course of European history, but also demonstrates how the work of three key photojournalists laid the foundation for modern war photography. Written in 1940, this work is a setting of a lament for one of the fallen in the Spanish Civil War by Stephen Spender. The scoring for male chorus with percussion and brass accompaniment gives the piece an appropriate wartime feeling. Related events in cooperation with the Spanish Embassy in Budapest, and the Cervantes Institute Budapest. Accompanying film screening series: Eyes on Spain. Screening the Civil War Memories on Wednesdays from 13 January 2016. This exhibition and its catalogue were made possible with support from the National Endowment for the Arts, Joseph and Joan Cullman Foundation for the Arts, Frank and Mary Ann Arisman, and Christian Keesee. Additional support was received from Sandy and Ellen Luger. The exhibition in Budapest was made possible with the kind support of the International Center of Photography, in New York City. The exhibition and the related events were co-organized by the Vera and Donald Blinken Open Society Archives and the Spanish Embassy in Budapest. The exhibition is on view until 21 February, from Tuesday to Sunday, between 10 am and 6 pm.